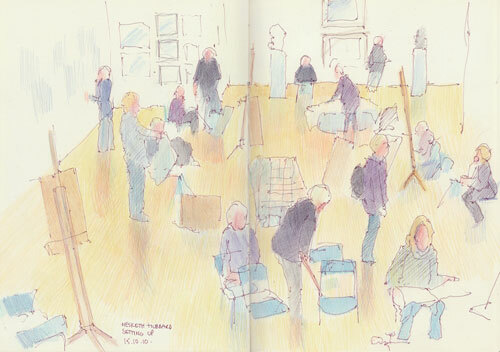 My post about the The Royal Horticultural Society Botanical Art Show reminded me that I hadn't posted another sketch done from above looking down at a group of people engaged on an activity. This sketch was done after going to see an exhibition at the Mall Galleries. I was late and the people arriving for the meeting of the Hesketh Hubbard Art Society were beginning to set up. The idea of drawing people who were about spend an evening drawing people appealed! 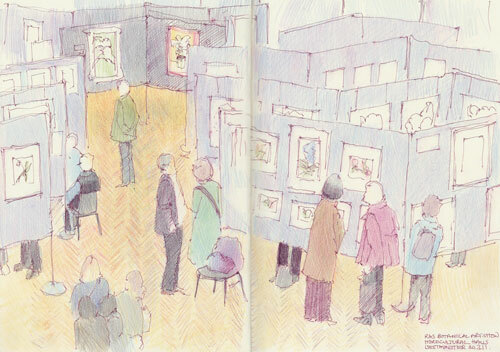 So I stood on the mezzanine entrance level, got my large Moleskine out and started to draw all the people beginning to arrange themselves and their chairs and easels. The Hesketh Hubbard Art Society has about 150 members and prides itself on being the largest life drawing society in London. Founded in 1930, it has been meeting regularly ever since. The Hesketh Hubbard Art Society offers both amateur and professional artists the opportunity to work from live models in untutored sessions. The Society meets at the Mall Galleries once a week, either Mondays or Fridays, and members may choose to work from four models: three ‘life’ providing 15 minute poses, 30 minute poses or a ‘long’ 2 hour pose and one clothed portrait. 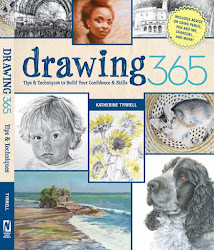 Membership is £200 a year, for which there are 48 drawing sessions and no cover charge. Once a year the Royal Horticultural Society (that's the people who run the Chelsea Flower Show) have a Botanical Art Show in London - at the RHS Horticultural Halls (near Vincent Square). 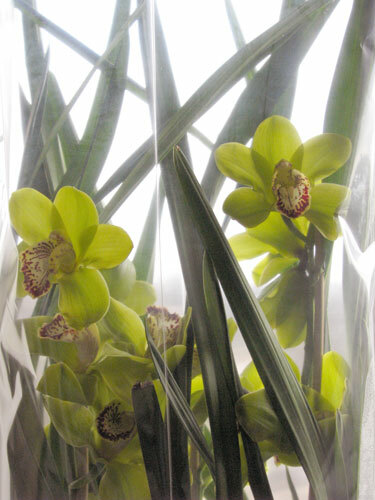 Yesterday the Orchid Show was in the Lawrence Hall and the Botanical Art Show was in the Lindley Hall. My extremely dodgy foot made me wait until it was Sunday before I could visit - so I could drive and park in a street nearby. It also made me sit down an awful lot. This sketch was done from the cafe on the first floor which looked down on the exhibition of botanical and floral art - a great place for sketching a view of an exhibition! pen and sepia ink and coloured pencils in Moleskine sketchbook, 11" x 16.5"
I met up with a friend I made a long time ago on Facebook recently. 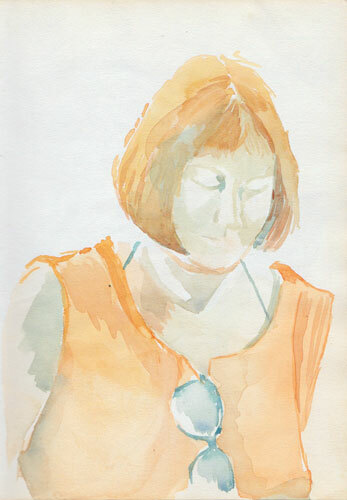 It reminded me of a watercolour sketch I'd paintedof her while we were on a painting holiday together in 1993! I think we'd got to the "challenges" stage of the holiday. You know the sort of thing - lots of limbering up and getting eye in has been achieved in the first week. Now it's the second week and time to "go for it" in terms of trying new things! So I tried painting directly with the brush ( no pencil first!) and only using two colours PLUS getting the full range of colours that I needed through using colour mixes, saturation and tints. This sketch is what I achieved. I was quite pleased with this effort which didn't take too long. I remember thinking at the time that maybe all those life drawing classes were paying off! I'm getting very fed up of being confined to home while I wait for my foot to improve. The problem is....that it isn't. While vaguely better, it's a very long way from being OK. This week I tried a slightly longer walk to see if stretching it might help. Anyway, these are those rather nice dusky purple pink anenomes which never ever come out the right colour when you photograph them - which is a good reason for sketching them! 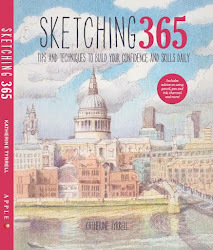 Today, the Derwent Pencil Company has published my article - 10 reasons to Sketch with Coloured Pencils by Katherine Tyrrell - on their lovepencils blog. 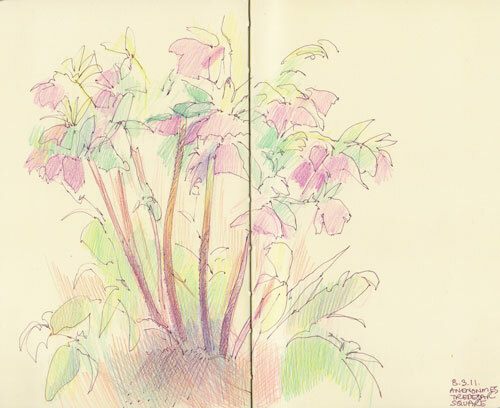 I've now been sketching with coloured pencils for over twenty years - following a tip from a professional artist about how easy and effective they were to use for sketching. 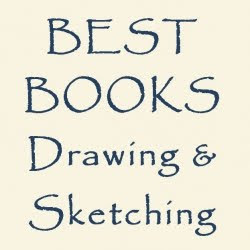 I'm so convinced of their value I have no doubt I'll be sketching with them for the next twenty years too! 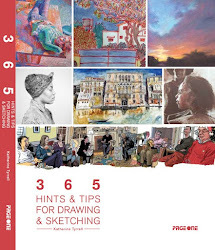 However I've always been really surprised that coloured pencils don't get mentioned more in art journals as a valuable sketching medium - for all the reasons I outline in the article. As you can imagine I was absolutely delighted to be able to give coloured pencils a higher profile by focusing on value as an article for the blog! Here are the 10 reasons - and if you want to know more you'll have to read the article! I'll be putting a FREE downloadable copy of the article - in a slightly different format - on the Making A Mark Guides page of my website blog later this week. If you've not tried coloured pencils as a sketching medium why not give them a go! 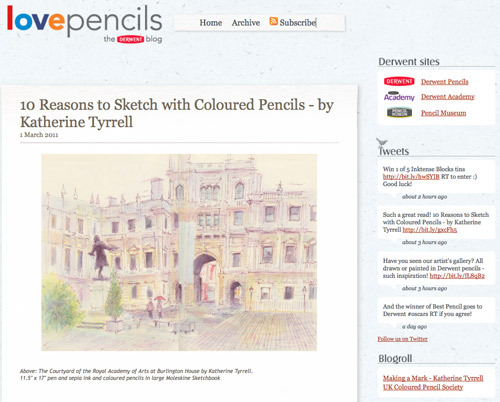 The lovepencils blog was started in November last year by Derwent - the Cumberland Pencil Company. It was great to see a major pencils manufacturer grasp the value that a blog can have for those who are fans of their products and the company itself. The Derwent ladies make a point (joke!) of posting on a regular basis. You can see the archive of past posts here. Plus the blog has now passed the magical three month mark - which means it's "a stayer"! (It's a fact that something like 90% of blogs die before they are three months old). If you're a fan of working with pencils I do recommend subscribing to the LovePencils blog. Apart from keeping you up to date with new products and product changes, the blog also has articles by artists working with pencils in different ways.